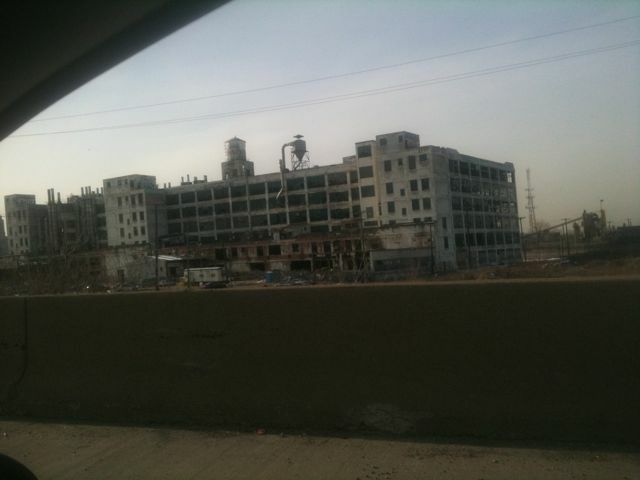 I got to spend some time last week in the urban catastrophe that is Detroit. While I was there, I felt the usual sadness – seeing the skinny bones of a once rich and proud city. I find that words are inadequate to convey the feeling of fallen empire that I get when I drive south on Woodward Ave – down from Seven Mile to the core. I can understand, at an intellectual level, the economics of abandoning a skyscraper or a factory. The owners leave it to rot in the same way that an underwater mortgage holder might walk away from a single family home. In some ways it’s simpler. There is no funeral or emotional attachment when a corporation goes under. Creditors descend, and a sort of sky burial ensues. Everything of value is divvied up. In this city, the buildings were not deemed valuable enough to keep or repair. It was literally easier to build new someplace else than to use those grand old structures. The vultures didn’t want these parts – and so they stand and rot. When a family or an individual has to give up on a property, I can usually trace the karma – the causes and conditions. When it’s a city, a civilization, walking away from mile upon mile of its infrastructure – something else happens in my mind. It feels different. It takes a powerful civilization to erect up a building even 10 stories tall. The optimism embodied by that sort of construction is palpable. Teams of hundreds of people, over months and years, give blood sweat and tears to build each and every one of those buildings. The capital accumulated over hundreds of person-years of efficient and careful work is poured back into stone and mortar. This is not the product of some village, scraping from harvest to harvest. These stones were laid by a culture that could afford art. These are beautiful buildings. The masonry and stonework in particular is striking. Done properly, we build a series of steps for our civilization to climb. What has taken up residence at the bases and fringes are villages. Ferndale, Royal Oak, Highland Park, and others. Out by 9 mile, they get semi-affluent. In the core, things are rougher. The defining characteristic is one of those tropes that I love in dystopian fantasy – people living among the remnants of a civilization that they could not rebuild. The communities are strong, and the people good – but the situation as a whole evokes a darkness and failure that cuts to my core. It turns out that what I love for its goosebump-inducing in Bladerunner is heartbreaking in person. At some level, we failed. The efforts of those thousands of people are being thrown away – along with the efforts of the hundreds of thousands who grew their food and thought it was important to do better than the generation before. We’re letting our staircase rot.